People always say it’s what’s inside that counts, right? This mantra can also be true for your home. It’s not so much the exterior of the home that matters as much as it is what goes inside. 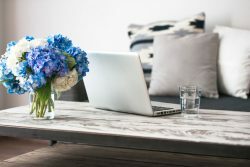 Turn any house into a home that you’ll love with these fun, easy, and creative DIY home décor tips. Draw a design in chalk. 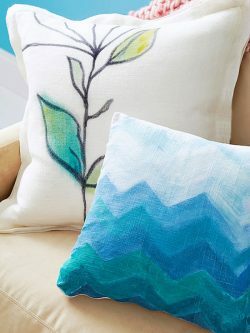 Fill in the shapes with fabric paint (or acrylic paint mixed with fabric paint medium) using a slightly dry brush and with quick strokes, allowing the canvas to show through. Painting both sides makes the pillow conveniently reversible. Prepare a well-ventilated work space and put on gloves. Spray pots with base coat spray paint until thoroughly covered; let it dry. Fill tub about halfway with water. Choose a few spray colors and lightly spray surface of water with 2-3 colors in a few spots. Use stir sticks to lightly swirl the paints until they create a marbleized pattern. Pick up a dry painted pot and quickly dip it into the water and place it on cardboard to dry right after. Continue this process with additional pots, adding fresh paint and occasionally changing water if doing larger quantities of pots and bases. Using a permanent marker, trace a circle on the beach ball around the air valve. Use this circle as a marker to reserve an opening for the light fixture and light bulb. Mix ½ cup glue and 1 cup of water in container. Stir thoroughly until the mixture resembles condensed milk. Wrap one 4-foot segment of twine around your fingers, creating loose loop. Dip twine into glue mixture, making sure that all the twine is saturated and then pull twine through your fingers removing the excess glue. Wrap wet twine around beach ball, avoiding the circle you drew in Step 1. Overlap the twine to prevent it from unraveling on the ball. You can use masking tape to hold the twine in place. Repeat steps 3 through 6 with remaining twine, overlapping strands on the ball until you achieved desired coverage. Let dry for six to eight hours or until twine is dry and hard to the touch. Slowly press the air out of the beach ball until it deflates being careful not to crush or dent the twine. Remove the ball. Pour 2 cups of latex paint and 1 cup water in pie tin and stir. Dip twine lampshade in several two-second intervals until you reach the desired color. Let it dry. Thread a hanging light kit through each finished shade. Use a low-wattage lightbulb. These DIY home décor ideas can give your home the boost of color and fun it may need. A little décor can go a long way. Hopefully you have found some inspiration to make your home more entertaining this season. Happy crafting!